Camelopardus! I’ve been wanting to do a retro review for quite a while – it’s been a while. But I’ve dug out some of my old DVDs that I purchased but never got to watch…and for this, I’m going back into my childhood (way back…) in the 70s world of Saturday Morning Television. Back in the days where you had just a handful of channels and had to adjust antennas to point in the right direction depending on the weather, Saturday mornings were the domain of kids programming. Primarily cartoons, occasionally there would be a live action show as well. In the cartoon universe, there were the major players like Hanna-Barbera and Warner Bros, there was also Filmation, who was firmly entrenched in Saturday morning programming since the 60s, working on early DC Comics shows featuring Superman and Batman as well as the Archie comics. In 1973, they produced Star Trek: The Animated Series. By the mid 70s they had quite a few cartoons in heavy rotation…but then they decided to break out into live action shows. Shazam! (which is being developed for a feature film) and The Secrets of Isis, but the two I remember most were Ark II and Space Academy, being the science fiction-crazed kid I was. Both shows only lasted 15 shows, but they were repeated often and I would watch any chance I could get. Both were released on DVD in 2006. Neither are currently in production, but you might be able to pick them up from resellers. Check out Amazon. Space Academy was my favorite. It was like Star Trek for kids, featuring kids – well, primarily teens and young adults playing teens. It is set on board a traveling academy built on an asteroid founded in the year 3272 (it is never specified when the series itself is set), where the best and brightest gathered to study and explore the mysteries of space. 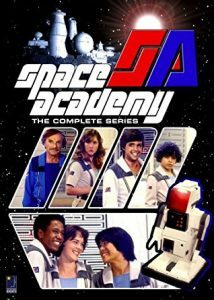 The show focuses on the Academy’s “Blue Team”. Ric Carrott as Chris Gentry, the captain of Blue Team. Ric also played the original Chuck Cunningham, Ritchie’s older brother, on the episode of Love, American Style that served as a backdoor pilot for Happy Days. Pamelyn Ferdin as Laura Gentry, Chris’s younger sister with which he shares a psychic bond. She made many appearances on shows in the 60s and 70s, and starred in Lassie. Brian Tochi as Tee Gar, the medical officer of the team and also has super-human strength through his martial Arts. Brian may best be known for his run as Takeshi in the Revenge of the Nerds movies, Nogata in the Police Academy movies, and the voice of Leonardo in the Teenage Mutant Nija Turtles movies. Maggie Cooper as Adrian Pryce-Jones, third in command of the team and the team’s technical expert. This was Maggie’s first role, but she would later star in the Chuck Norris film An Eye for an Eye and had a recurring role on Falcon Crest. Ty Henderson as Paul Jerome, a transfer from the Red Team, his introduction shows him as a tough loner but he warms up to the team quickly and his high intelligence aids the team. Ty would later guest star in a number of shows, including recurring roles in Madame’s Place and Santa Barbara. Eric Greene as Loki, who was found as a lone orphan on the planet Zalon. He joins the team, which vows to find where he came from (although this is largely forgotten after the first few episodes.) Eric went from acting to get a law degree and works in civil rights and is also an author. Erica Scheimer as the voice of Peepo the robot, who gets into as much trouble as Loki. Erica is the daughter of Filmation founder Lou Scheimer, and did many voices on Filmation shows. Being kid oriented, stories were somewhat simplistic. The show was in 30-minute episodic format, with little carrying through from episode to episode – normal for the time. And since it was aimed at kids, so there would be some sort of lesson or moral to each. Heck, I think there was more to learn from these shows than the so-called “E/I” tagged shows these days. The acting wouldn’t win any awards, but again this was Saturday morning kid stuff and an early venture into live-action programming for the studio. I suspect it was perhaps more at the production level plus the inexperience of some of the actors. I didn’t care at 10 years old though, and I . The late, great Jonathan Harris, as he generally did, performed every scene with an all-in attitude regardless of the material, and could make everything work. Pamelyn and Brian, having the most experience, did seem to excel at delivery more than most. Speaking of Pamelyn Ferdyn and Brian Tochi, a bit of trivia – the two had previously worked together in the episode “And the Children Shall Lead” in the original Star Trek, where they were two of the children who took over the ship. And I have to say, I had a crush on Pamelyn back then – she had such a cute face and I recognized here across her many guest appearances on various shows, including The Odd Couple and The Brady Bunch. If some of the voices sound familiar, you’ve probably heard them many, many times on other Filmation shows. Even Lou Scheimer himself is uncredited as a voice in a couple episodes. I recognized the voice from other cartoons, but never realized it was Lou! Even some of the live action guests were better known for their voice work, such as the aforementioned Johnny Sunseed, played by Dal McKennon, who’s voice work includes Lady and the Tramp, Bedknobs and Broomsticks, and over a 100 others. And in the spirit of “don’t build a new one if you can re-use what we have”, not only does a heavily modified Robby the Robot make a guest appearance, but all the sounds and incidental music were recycled, mainly from Star Trek and Star Trek: The Animated Series. And then ultimately, after the show ended the sets and models got re-used in a sequel series, Jason of Star Command – which should show up in a Retro Review soon as well! Despite it showing its age and probably not appealing to a modern science fiction fan, I still LOVED this show. I’m so glad I finally took the time to watch it again. I miss being a kid.